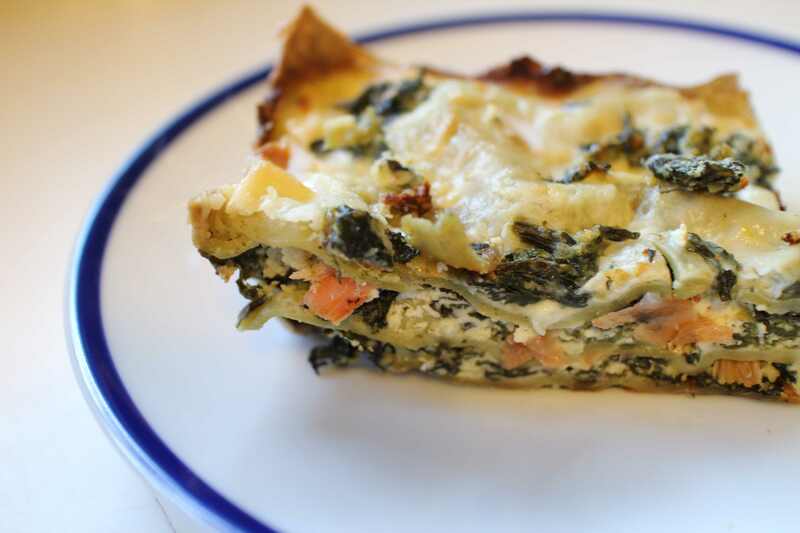 There’s nothing like spinach to lighten up lasagna or lox to brighten its taste. 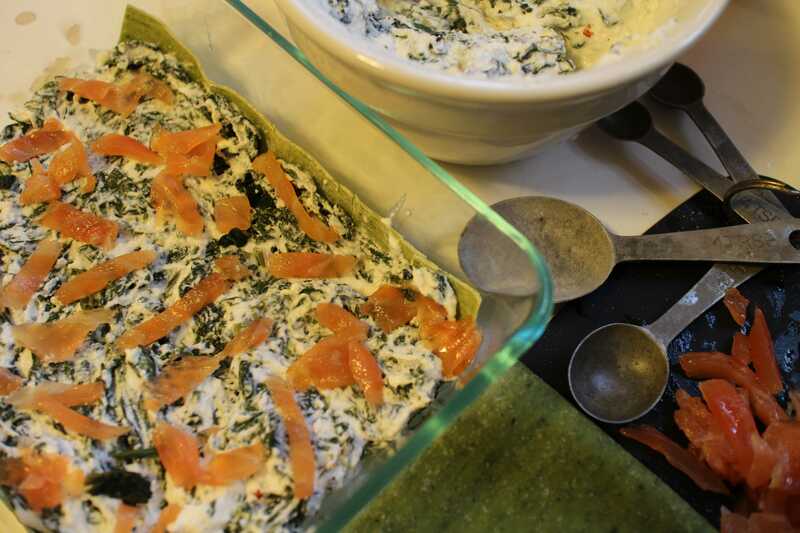 I layered fresh spinach pasta with spinach-laced ricotta dotted with pieces of home-cured salmon to create a delicious spring treat. When spinach first arrives in the garden or famers’ market, I use it in abundance and to abandon, reveling in the greens that announce the arrival of the growing season. I was thrilled to make my own lox and determined to diversify how I used it. This lasagna was beautiful as well as delicious and scarcely needs anyone to twist your arm to try it. Lightly oil a 6x8x2-inch glass or ceramic baking dish. Lay slightly damp but absorptive towels on the counter. Bring a large pot of water to a boil. Place a large bowl of ice water in the sink. When the water boils, dunk the fresh pasta sheets in the hot water, one at a time, for 20-30 seconds, and then in the ice water for a few seconds. Spread them flat on the dampened towels to drain (dampening keeps them from sticking to the cloth). Dunk the spinach in the boiling water for a few seconds and drain it in a colander. (You can also shock it in the ice water to cool it first.) When the spinach is cool, squeeze as much water out of it as possible and chop it. Season with salt and pepper and set aside. Beat the egg lightly in a medium bowl. Add the ricotta cheese and chopped spinach and mix thoroughly. Make a béchamel sauce by melting butter in a medium saucepan over medium heat and whisking in the flour. Cook for a few minutes ad gradually add the warmed milk, continuing to whisk the mixture until smooth. Simmer for 5-7 minutes or until it has thickened. Remove from the heat and let cool slightly. Bake in a preheated 350 oven for 35-40 minutes or until the sauce is bubbling and the top is lightly browned. Remove from the oven and let the lasagna sit for 10 minutes before serving.